Hanukkah Judaica and other gifts appeal to all the senses—from the touch of an about-to-be-spun dreidel and look of candle flames flickering against a new menorah to the sweet flavor of a delicious treat. Fold Back Israel-based Shelly Agronin‘s Wallaby folded metal series of home goods are marvels of design that require a DIY touch before using. 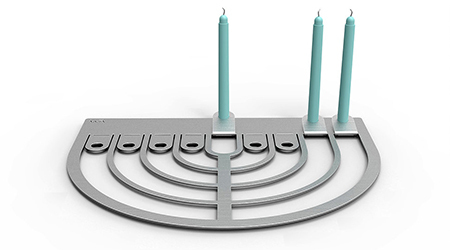 The designer’s brushed aluminum flat Hanukkiah, from $40, requires you to bend back the candleholders. 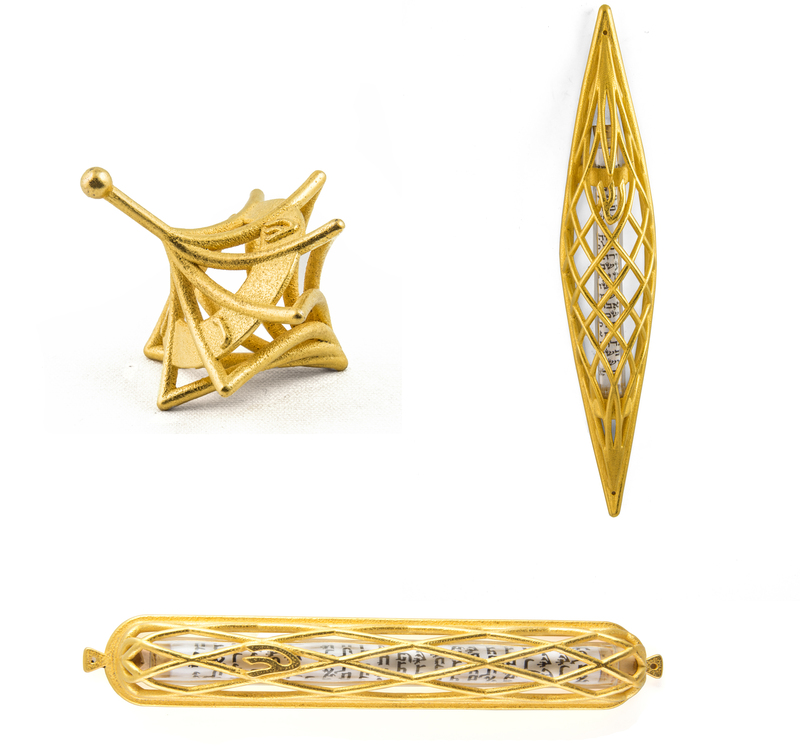 Golden Twist Judaica artist Joy Stember’s intricate new 3D printed designs include the Twisted dreidel, from $100, available in gold-plate or nickel finish; and the Noah and Long Noah (bottom) mezuzas, from $176 each. Flame On Israeli company CeMMent’s focus is on clean, minimalist style. Their newest menorah‘s cut stainless steel design mimics the flame of the Hanukkah candles; in red, black, grey and white, from $74. A New Arrangement Every Night Logifaces Miracle Edition concrete menorah by Hungarian 3D puzzlemaker Logideez is composed of nine triangular pieces with varying angles that can be repositioned in an array of imaginative forms—including a Star of David (packaging comes with a few suggestions). The playful yet simple menorah, inspired by the company’s award-winning Logifaces geometric puzzle, is available in ash, basalt, rose and white, from $59, or their newest version, supercolor (right), from $65. Built Tough Pangea Designs’ titanium EDC (everyday carry) Dreidel is a throwback to childhood Hanukkah tops but with a more adult aesthetic. The DLX model (right), from $40, has a tungsten ball tip for a smoother spin experience; the basic model, from $30, also comes in distressed blue. A New Spin The open geometric patterns and rounded form of Quest Collection’s blue-and-gold dreidel are inspired by Moroccan latticework and wall tiles, from $84. Those who want to commemorate love on the Festival of Lights should check out the company’s Wedding Dreidel, from $116; it is topped with the figures of a bride and groom who seem to dance when the dreidel is spun. The Scrub Is Biblical Zo’e Apothecary finds skincare inspiration from Jewish and biblical women. The Winter Woes collection has Osnat Salve for congestion and Savta Salve for sore muscles, each from $18. Or try Lot’s Wife Dead Sea salt scrub, from $25, and Night in the Negev activate charcoal soap, from $10. Wear Your Truth The shirts below are just some of the many biblical or inspirational T-shirt designs in Hebrew and English at WearBU, a new graphic clothing company. Jewish founder May Katz’s Faith Tees selection has options that will appeal to people of different beliefs; T-shirts from $25 each. 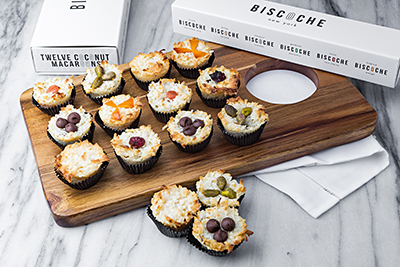 A Passover Sweet For All the Holidays Macaroons are now ubiquitous year-round, and Biscoche’s cupcake-shaped take on the gluten-free coconut treats comes in a range of intriguing flavors, including tart cherry, caramel, mango, pistachio and chocolate chip; in assortments of 6, 12 or 24, from $28 to $72. In Praise Of Kfar Saba-based Ravit Hasday creates detailed pieces engraved with Jewish texts. Her Eshet Chayil multiband sterling silver and onyx or ruby rings, from $185, has the entire Woman of Valor psalm from Proverbs. The gold-filled and pink tourmaline pendant necklace (center), from $99, part of her Idan Raichel collection, includes a phrase from the Israeli singer’s hit “Before It All Ends,” in Hebrew and in English. Blue and White, And Trending Enamel jewelry is popular this fall and winter, and Tel Aviv-based master jeweler Natalie Ulfskiy of Mitzafon Enamel handmakes her delicate one-of-a-kind enamel pieces. Her pendant necklace is based on Azulejos tiles from Portugal, from $142, and her colorful flower ring will lend a touch of spring to the coldest winters, from $113. Put a Ring On It The natural colors and ancient artifacts found in the Galilee are referenced in Gil Yuda’s one-of-a-kind jewelry. The Israeli-born silversmith often uses Roman glass in his pieces, such as in these sterling silver rings, $140 and up, and sterling silver rope pendant on a jade and silver faceted pyrite necklace, from $210. Received this less than 2 weeks before Chanukkah. Too late for me to order anything. Please advertise with air mailing people in mind……. not just domestic usa. Beautiful! I’m a professional makeup artist who teaches online makeup courses and I think I should buy and let my audience know about all the pretty pieces of jewelry highlighted in this article. Best!